The Australian Senator for Beijing? 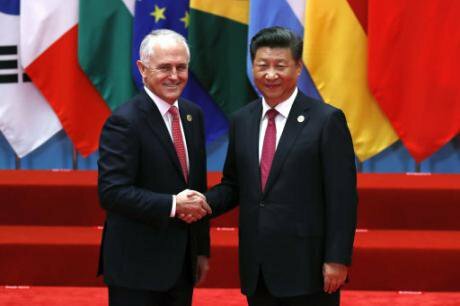 Australia's PM Malcolm Turnbull shakes hands with China's President Xi Jinping at G20 Summit in eastern China's Zhejiang province, September,2016. Associated Press/Ng Han Guan. All rights reserved.It is hard for those of us who are not members of the NSW Labor Right Faction to feel much sympathy for its members who get into trouble, but the events leading up to Senator Dastyari's resignation from the Opposition Front Bench deserve further scrutiny. Perhaps the most interesting feature of these events is that, while the Senator fessed up, repeating ad nauseam "I made a mistake", he did not tell us what exactly his mistake was. Was it that he asked businesses to pay some of his personal expenses? Or was it that they were foreign and, if not foreign, then Chinese-owned, businesses that appeared to have, as many Chinese-owned businesses do, links with the Chinese Government. So, in owing these businesses, Dastyari may appear to have owed something indirectly to the Chinese Government. Meanwhile, those of us who are not on a 200K+ salary with work-related travel expenses thrown in are left to marvel at the sense of entitlement that enabled the Senator to flick expenses he had no wish to pay himself off to a couple of businessmen. What might he have done that they have already owed him for or what might he have to give them in return? To be fair, many of Dastyari's Coalition critics were not much better; everyone agreed that he had broken no rules in twice asking Chinese-owned businesses to pay his bills, one for the relatively small, given his salary, travel expense of $1670 and the other a $5,000 legal bill; nor was it disputed that he had taken part in a press conference on June 17 with Huang Xiangmo, owner of the Yuhu Group, who paid the legal bill. Dastyari was quoted in a Chinese-language report as saying “The South China Sea is China’s own affair... Australia should remain neutral and respect China on this matter.” This was interpreted as taking a position on the South Chine Sea dispute that was more sympathetic to the Chinese Government's position than the stated Government and Opposition policy that all parties should respect international law – as Australia can hardly claim to have done. If this last comment seems harsh, think of Australia's participation in American-led invasions of dubious legality, its disgraceful conduct during the current dispute with Timor L'este over control of a large oilfield in the Timor Sea and its persistent evasion of crucial provisions of the UN Refugee Convention. Dastyari claimed that he had either been misquoted or had “misspoke”, an awkward American euphemism for saying what you did not mean. He also repeated that he supported Labor policy on this issue. His critics took him at his quoted word suggesting that this was a case of cash for comment and, further, that Opposition leader Bill Shorten should have dismissed him from the Labor Front Bench. Shorten's failure to act on this was interpreted by the Prime Minister and Treasurer as a sign of weakness. Labor did its best to tie Dastyari's conduct to the broader issue of foreign donations to Australian parties – an area where everyone agrees that reform is needed – but the Coalition would have none of it, insisting that a donation to an individual was unlike a donation to a political party. Its suggestion was that if there was a link between the Senator taking money from Chinese companies and him subsequently speaking out on China's side in an international dispute, the Senator's mistake was not so much the act of asking a private business to handle some of his bills as that of raising the suspicion that in accepting this payment, he had enabled the business owner to influence his views. Or perhaps his mistake was to say something sensible about Australia's relations with China, not something we normally expect from our politicians. What, then, of the views Dastyari seems to have expressed? The first difficulty we face here is that in the absence of a full transcript, it is not clear what, other than the quoted words, the Senator may have said about the issue. Suppose he had really said something like “The South China Sea is an issue for China to sort out with its neighbours in accordance with the freedom of the seas” adding that “Australia should remain neutral and respect China's views...” ? The first sentence, qualifications included, seems harmless enough but the second would still have landed the Senator in trouble. The point about remaining neutral and respecting China's views challenges Australia's bipartisan approach to the South China Sea, which is not simply to endorse the freedom of the seas but also to support America's aggressive actions on the issue. There is little evidence of serious Australian attempts to understand China's views – reports published by the Lowy Institute, which bills itself as Australia's leading think tank, have taken a solidly one-sided view of the South China Sea dispute. Those of us with no specialist knowledge of China could do worse than acknowledge that, while China was a founder member of the UN and remains a permanent member of the Security Council, only the defeated Taipei (ROC) government was recognised by the UN, a situation that changed only after President Nixon's visit to Beijing in 1971. As a result, the Beijing (PRC) government, was not recognised by the UN as the legitimate government of China and it took no part in formal UN discussions before that time. There is nothing in the history of China's relations with the west that would lead it to respect the law of the sea. It must be tempting, and not entirely unreasonable, to view the law of the sea as essentially an artefact of competition between western imperial powers, a law whose imperial character has not changed much in the post-WW2 period. China (PRC) was able to participate in the negotiations – 1973-82, while it was still feeling its way around the UN system – leading up to the most recent and generally accepted version of the law of the sea, UNCLOS, which finally came into force in 1994. China would also be aware of USA's unilateral assertion in 1945 of its control over areas of the high seas contiguous to the US coast, and also of America's heavy-handed behaviour before finally agreeing to Part X1 of UNCLOS. Why, then, should we expect China to be impressed by a Hague tribunal's ruling that China had no historical rights over the South Chine Sea, particularly as the USA has now set itself up as the chief enforcer of the LOS? There would have been no political advantage for anyone in attacking Bob Carr on this issue, while attacking or – in Labor's case – doing little to defend Dastyari's views had the advantage of avoiding the issue of Australia's subservience to the USA. The Dastyari affair, in other words, has put off the informed debate about how to manage our relations with China, our largest trading partner, and America, our most powerful ally, that Australia desperately needs to have.